Whoever thought in years past that America would be acting out "The Lord of the Flies"? For many, that question is remote and obscure to their experience and knowledge. It refers to a novel by William Golding, a British Nobel prize winner, that came out in 1954. It is a book that, like George Orwell's "1984," came in the aftermath of World War II as the West faced the growing threat of nuclear war and the Cold War detente with the Soviet Union. It was an effort to explore how it was possible for Hitler to take over Germany. For years, it and "1984" were standard reading fare in high school curricula in the U.S. Americans were familiar with the allegorical implications of the pubescent boys whose plane crashed on a deserted island and went through the struggles of forming some kind of social organization, which grew out of their dog-pack instincts, ignorance, and superstition. The rise of Donald Trump has an uncanny parallel to the moves of the character Jack in "Lord of the Fllies," who wants the power of leadership over the boys. He does so through incivility and irrationality that appeals to the primitive savagery in humanity which civilized culture attempts to control. The book portrays the mindless desire for power and consequence in the boys and the power that bullies have over their schoolyard peers by promising them power. In their quest for status and consequence, people line up behind the bullies in the hopes that their support will move them up in the dog pack and give them favor which is gauged by how much they can demean and inflict their will on other people. Donald Trump openly uses the tactics of juvenile insult and abuse against his rivals and opponents and promises to make America great again. He defines greatness as bullying the rest of the world, and promises to force Mexico to pay for a wall that will keep Mexican immigrants out of the U.S., to ban Muslims, and to create a multitude of high paying jobs for Americans. He offers no coherent plans for how he can actually achieve his promises, but the poor gulls to whom he appeals slaver at the thought of strutting around and imposing their will on the rest of the world, with no inkling of the consequences. Many pundits offer explanations for Trump's success based upon their theory that politicians did not recognize the dissatisfaction of people with big government, the loss of jobs to China and the Pacific Rim, the slow recovery from the great recession, and America's changing role in the way it leads the free world. There is little acknowledgment that the current American economy was created by the Reagan-regime's devotion to trickle-down economics and the deliberate efforts to change the U.S. from a manufacturing to a service economy. The inequality that Bernie Sanders has made a central issue of his campaign is rooted in economic policy that creates and cares for the richest of Americans. Donald Trump is the voice of the one percent. He represents and speaks for a segment of population that is looking for scapegoats to blame for their dissatisfactions and disappointments. That segment of the population is bereft of intellectual functions, conditioned by a media of "reality" television, talk radio, tabloid cable news, bumper sticker internet, and education systems geared toward docility rather than coherent thinking. Orwell's "1984" was not merely a warning about the danger of totalitarian government, but also a warning on how the electronic media could be used to condition people into mindless automatons. We have in previous posts noted the similarities of America's political situation with the people who fell under Hitler's spell. The parallels to Germany of the 1930s and the current political climate in the U.S. are striking not just because there are leaders, such as Trump, who are advocating the massive oppression of people based upon race and religion; the parallel is that there is a critical mass of people frothing at their mouths in anticipation of inflicting oppression, exclusion, and violence on their chosen hate objects. All they need is a bully to lead them into action. The fact that the stupid person is often stubborn must not blind us to the fact that he is not independent. In conversation with him, one virtually feels that one is dealing not at all with him as a person, but with slogans, catchwords, and the like that have taken possession of him. He is under a spell, blinded, misused, and abused in his very being. Having thus become a mindless tool, the stupid person will also be capable of any evil and at the same time incapable of seeing that it is evil. He observes, "the power of some needs the folly of others." That is a penetrating definition of the relationship between a malicious bully and his minions. It is the relationship William Golding portrayed in "Lord of the Flies." In a democracy, while people may rail at the quality of its leaders, the people eventually get as their leaders who the majority votes for. So, the character of the leaders reflects the character of the people who comprise the majority. The rise of Trump, therefore, does not reflect the brilliance of his personality, but, rather, the intellectual dullness of his supporters. 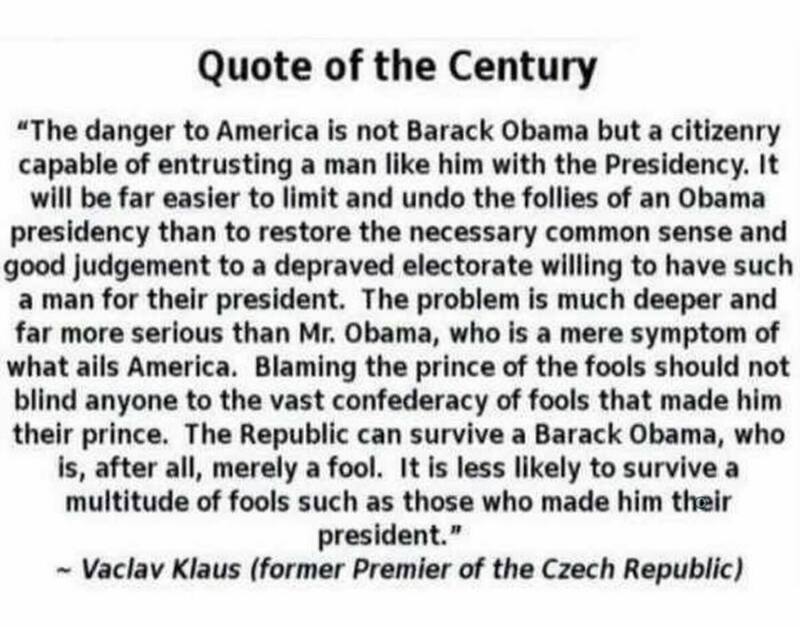 Snopes has debunked this alleged quotation, citing misattributions to Czech newspapers and that Vaclav Klaus and Obama had a respectful relationship. The alleged quotation is a symptom of the intensity of the political division among the American people. 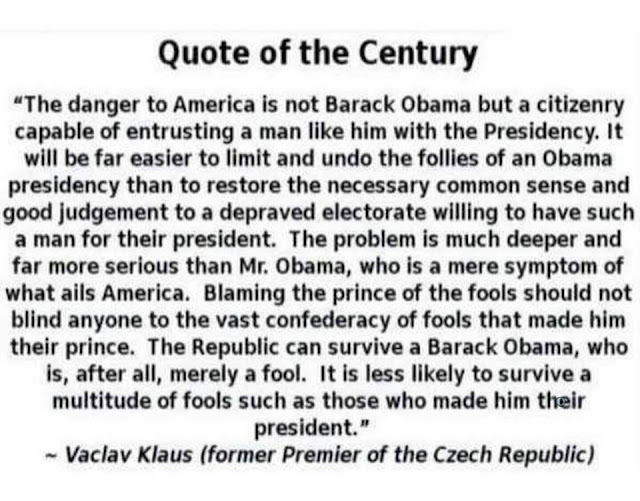 It is based upon a presumed discrediting of Obama, and the raging resentment of having a black man occupying the White House. It is the crying out of devotees of Jim Crow for their good, old days of segregation and racial hatred. 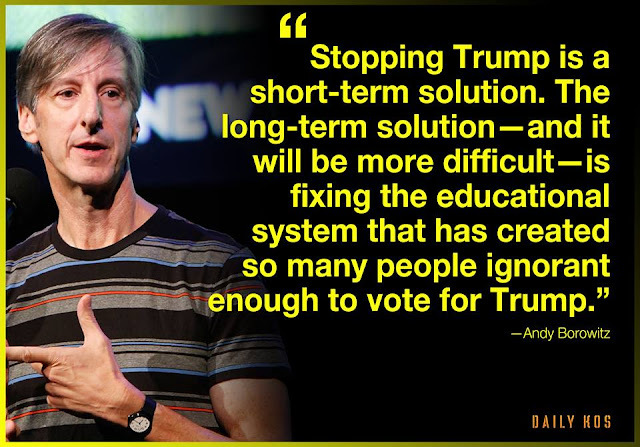 In contrast, Andy Borowitz's comment has the documented evidence of a segment of the electorate that has abandoned any pretense to intellectual integrity in favor of an attitude that rejects all facts and standards of decency as political concerns. Donald Trump tells proven lie after proven lie, as the Washington Post fact checker points out, and his supporters cling to his insults and abuse of those they hate as speaking out for them. A number of observers of the current political scene have stated that among the Trump supporters, facts and truthfulness do not matter. They have rejected the very standards of enlightenment and intellectual integrity out of which America grew. The big question that will come out of the election of 2016 is a not a matter of who will be president. It is a matter of whether there is any way or even any desire to rehabilitate a country whose founders made education and rational coherent thought the main underpinning of the democracy. "The Lord of the Flies" ends when a passing naval ship sees the conflagration that the warring boys have set on the island . An officer tells the boys that their "fun and games" are at end and civilization has come to their rescue. For America, the only similar hope is for some alien race from another planet to come to earth and rescue the people who are still interested in a republic that wishes to continue the expansion of the principles of its founding documents. The alternative is the inevitable violence of those who wish ignorance and racial hatreds for the future of humankind. Right now, we are reenacting "The Lord of the Flies."